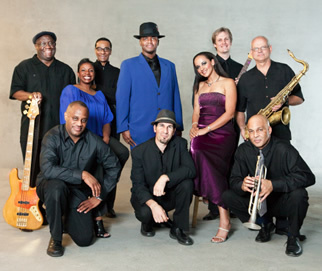 Local jazz icon and bass player Tony Muhammad serves as the musical director. A former student of the late great jazz bassist Milt Hinton, he plays both acoustic and electric basses. On the trumpet is Derek Cannon. The accomplished performer earned a Bachelor of Arts in Music, and Master of Music degrees from San Diego State University. Cannon has performed with legendary entertainers like Natalie Cole, Clark Terry, The Four Tops and The Temptations. The talented drummer Russell Bizzett has a gift for rhythms that gives him a rare versatility with different music types and styles. He brings the rich fullness of this experience to his performances. Native San Diegian Jeff Moore is the gifted guitarist. He has rocked out on stage with super-stars like Gary Puckett, Chuck Berry, Solomon Burke and Neville Brothers. His inspiration to become a musician began in 1964 when he saw the Beatles play on the Ed Sullivan show. The renowned musical artist John Rekevics serves as tenor saxophonist. Rekevics has appeared with popular performers such as Johnny Mathis, Marilyn McCoo, the Fifth Dimension and the Temptations. Additionally, the faculty member of San Diego State has recently recorded on the American Gramophone label. Rebecca Jade delivers as female vocalist. Her passion for music stemmed from growing up in church and in a musical home. A graduate of University of California Berkley, Jade has been singing professionally for the past five years since and has performed with some of San Diego’s best musicians. On the piano is the smooth sound of Kamau Kenyatta. Originally from Detroit, his versatility comes from his early exposure to a vast array of musical styles. 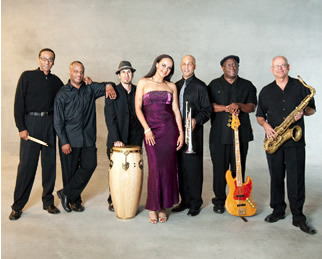 Kenyatta has worked with jazz greats such as Hubert Laws, Earl Klugh, and Donald Byrd. Kevin Flournoy also serves as a pianist. Flournoy devoted himself to the study of classical piano and contemporary organ at the University of California, San Diego where he earned a Degree of Bachelor of Science in Electrical Engineering and a minor in Music Science & Technology. He has produced, written, performed and recorded with many artist including Gladys Knight, The Pointer Sisters, American Idol (TV), Hillary Duff, and Jamie Fox.